There are several ways you can get your hands on MP3’s, some are free, some are kind-a free, and some are not free at all. Of course, there is always the option to copy your music CD’s to MP3 (MacOS X). The short version: Look for MP3’s with a variable bitrate ≥ 128 Kbps (normal use) or ≥ 256 Kbps (high quality). Bitrate, or how many samples are taken per second, can have a significant influence on the quality of your MP3’s. The lower the bitrate, the worse the quality, but also the smaller the file will be. So we need to find a balance between size and quality if storage is a concern – In other words: how many MP3 songs will fit on your MP3 player. Personally, I think that for normal use 128 Kbps – 192 Kbps can be considered good and suitable for most situations. I most certainly would avoid anything below 128 Kbps. For high quality MP3’s we look at 256 Kbps – 320 Kbps. Your choice in the end is a matter of how well your hearing is, available storage space, and personal opinion in the matter. Pretty much anything plays MP3’s, but only some devices play Apple’s AAC. Specially in the lower bitrates (below 256 Kbps) you might her a difference — MIGHT being the operative word here. My prefence, for compatibility reasons: MP3. Variable bitrates have the advantage that the bitrate only goes up when needed, which results in a more efficient compression (ie. smaller file size). Back in the day, quite a few MP3 players were not able to handle VBR (Variable BitRate), but today it will be hard to find and MP3 player that cannot handle VBR. My personal preference is using Variable Bitrate. Companies like Apple, Google and Amazon have quite a selection of MP3 songs you can buy individually – and quite often certain songs are offered for free. The free ones are typically not the most recent ones of course. Personal Note : If you’re really into music, I’d consider just spending that one buck on the song you really like. Think about it this way: with the other “free” methods you’ll get your song for free but it can be quite a task to find your song and to then actually download the song, hopefully in the quality you were hoping for. Think about how much time you’re spending on getting this “free” song!? As far as I can see Amazon has the edge with the ability to download DRM (copy protection) free high quality MP3‘s. Pricing seems fair and a simple download tool helps you download your purchase over and over again. Amazon is also the one where I have seen most of the free songs offerings. Amazon is not geared to any playback device in general; PC, Android, iPod/iPad/iPhone, it really doesn’t matter. Note : To find free MP3’s at Amazon visit this page: Amazon Free MP3’s . Google Music is a close second which also offers DRM free high quality MP3‘s for download as well – but Google is relatively new in this market and prices are sometimes slightly higher thanAmazon . Google Music is also not (yet) available outside of the USA and more geared towards PC and Android users. Apple, well,… Apple is Apple … no music without iTunes (which means no support for Linux for example). They promised DRM free music but it appears they’ll be charging a few cents extra for each songs now. Not a big deal when you consider that instead of MP3 files, you’ll be getting AAC files. Apple is very much geared towards PC and iPhone/iPad/iPod users. What is the difference between AAC and MP3? For you and me probably nothing, except that your MP3 player might not be able to handle AAC files – file conversion might be needed. For someone who is particular about audio, this might mean the difference between day and night in sound reproduction quality. MP3 uses a so called lossy compression, to make the file smaller parts of the “information” that we do not hear will be removed (simplistically put). AAC on the other hand uses a lossless compression method – meaning all the fine details that an audiophile might hear remain, no information will be removed. Specially at high bitrates, most people will not notice the difference. Note : The website ItsFreeDownloads keeps track of the free song and video offerings of iTunes. 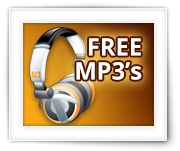 There are boatloads of websites offering free MP3’s, and often in a very good quality. But you have to wonder … how do they do it? How can they offer music for free where companies like Apple, Google and Amazon charge you. It’s up to you to think about that. Caution : some of these sites will try to lure you into one or the other paid service – so pay attention what you’re doing. None of the following methods can be considered legal or safe – proceed at your own risk. Usenet has been around for a very long time and most certainly was not intended for sharing music, videos, programs, ebooks, etc. But that’s what’s happening in reality. Accessing Usenet can be cumbersome for less experienced computer users and often ends up with paying for a service anyway. It is a great resource though … but for now I’ll skip most the details. Bottom line is that you will need access to UseNet – most Internet Providers offer this one way or another, but typically stripped from the groups offering free music, movies, etc. UseNet is originally a distributed discussion system for academic use. Discussions are found in multiple interest groups, and swapping binaries (programs, music, etc) became such an interest. This became even more interesting when trick were devised to add binaries to the text messages used in these discussions, resulting in the exchange of binaries more and more. In this day and age I would say that the a vast amount of messages in Usenet groups are actually binaries, which is why your ISP (Internet Service Provider) blocks those fun groups in their Usenet groups offerings. That’s why you’ll have to resort to paid Usenet services and in that case it might be better to just buy the songs. To give you an idea: there are so many MP3 related groups that a large provider like GigaNews only displays the first 50 groups (!). BitTorrents, or just short Torrents, again something not originally designed for sharing music, videos, etc. Torrenst however are a more accessible method for most to get your music. Torrents are originally designed to improve download speeds by having downloaders share the parts that they already have downloaded with other downloaders. This way no server is needed and very good download speeds can be achieved. Keep in mind that torrents can be considered not-so-safe when you’re trying to get illegal downloads. Quite a few Internet Providers log, block or even threaten their customers that do use torrents – even when the downloaded torrents are fully legal. 1. Go to a website that indexes torrents and find the file you’re looking for. 2. Download the torrent file. 3. Open the torrent file with your BitTorrent client (for example uTorrent), which then will start downloading AND sharing the file. The sharing part is the “bad” part when it comes to illegal files. Files or part of files you have made available will be shared with other users who are trying to download. This includes parts of the torrents you are currently downloading – it’s the principle of torrents, which can make torrents fast without the need of a central server. With illegal files, this means that you’re participating and offering illegal files as well. Be very aware that, even though companies offer [paid] safety, there is no real safe way of using Torrents – even with VPN and TOR! The eDonkey network is a P2P (peer-to-peer network), which could be seen as a successor to Napster. Originally the eDonkey2000 Windows client was the only proper client for this network. But eMule quickly became the dominating client (2002). Variants for Mac (aMule), Linux (xMule), and even Java (jMule) emerged. To date eMule is still very popular, even though it seems that the world is more focussed on Torrents. Since the MPAA and the likes heavily hunt down these kind of peer-to-peer networks, I would say that this is not a safe way of getting MP3’s either. Over time, after the dead of Napster in 2001, other P2P network clients appeared like LimeWire, FrostWire, BearWire, etc. LimeWire by court was ordered to stop in 2010. Any LimeWire version you would buy today is not related to the original LimeWire – and the fact that you’re paying is already a good indication of a rip off (see message on the official LimeWire website). No guarantees … proceed at your own risk … again not a safe way to get your MP3’s. There are 7 comments. You can read them below. The best way for me to download single songs (the favorites i remember often) is grooveshark, off course there you can’t download songs but be clever…search g. downloader ;) and you will find that awful tool, and it is portable :D.
Free Music Downloader also worth to have a try, it is similar to Beemp3s. Thanks for the tip LouisJovi! I’m using these two to download music from SoundCloud and YouTube. Works great. Just want to share with you. Thanks TinyStars for sharing – it’s much appreciated!